Before the current season began, something suddenly clicked in the mind of Geoff Carlston, coach of The Ohio State University women’s volleyball team: The NCAA Division I Women’s Volleyball Championship was coming to Columbus and Nationwide Arena on December 15 and 17. The Buckeyes have that opportunity, as they’re one of the 64 teams in the tournament. Ohio State takes on Missouri State on Friday in Manhattan, Kansas in the opening round. The winner plays the winner of the Kansas State (the 14th seed) and Lipscomb University match. While the talented Buckeyes had an inconsistent season and are not one of the 16 seeded teams in the tournament, they are quite capable of advancing far into the tournament. Ohio State has beaten Nebraska, the tournament’s No. 1 seed, and also topped Michigan State (No. 9) and Penn State (No. 16). The Big Ten is the country’s best conference, with the top-three seeds (Nebraska, followed by Minnesota and Wisconsin), six of the 16 seeds, and a total of eight teams in the tournament. Nebraska is the defending champion. There are five Ohio teams in the tournament: OSU, Cleveland State, Cincinnati, Dayton and Miami University. This is the second-highest state total, behind only Texas (7) and further evidence that Columbus and Ohio are volleyball hotbeds. “We’re two good weekends away from playing in front of Columbus fans and how cool would that be?” Carlston said, adding the key to reaching Columbus will be “staying healthy and catching a little lightning in a bottle” and taking it one point, one set and one match at a time. 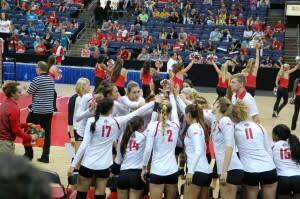 It all begins with the Missouri State, which edged Ohio State on September 9 in a five-set match. Carlston said the Bears are a talented team, but added the Buckeyes have improved a great deal since September, helped along by the intense competition they faced in the Big 10. If Ohio State and Kansas State each win their first-round matches, this would mean a matchup between the Sandbothe sisters: Taylor, a senior at Ohio State, and Elle, a freshman at Kansas State. The Sandbothes are from Lee’s Summit, Missouri, which isn’t far from Manhattan, and a lot of family members and friends will make the trip. “We’ve already had 50 people texting asking how can we get tickets,” Taylor said, adding everyone wants to know what to wear. Perhaps a K-State shirt and an OSU hat? Or maybe a purple-and-scarlet stripped shirt? Taylor quickly nixed the purple-and-scarlet shirt idea. “I said no, that’s ugly, don’t do that,” she said. 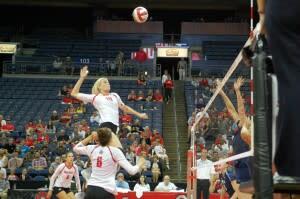 Taylor is the OSU career leader in blocks and could find herself inches from her sister, separated by the net. It will be an ALL CAPS moment. This will be Taylor’s third and final NCAA tournament – and Elle’s first. “I preach to her that it goes by so fast and she’s like, ‘OK, old lady,’” Taylor said. The Sandbothe sisters are two of the many talented athletes who will take to courts all over the country starting Friday. Volleyball has come a long way in recent years, and the women’s game is fast and furious, and features exciting rallies, fierce spikes, diving saves and lots of action. 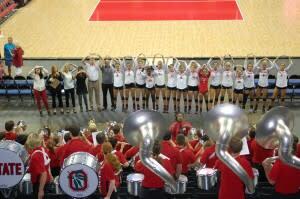 It’s become especially popular in central Ohio, led by the Ohio Valley Region of USA Volleyball. There are still tickets left for the semifinal games and championship game at Nationwide Arena on December 15 and 17. Click here for ticket information.